During her interview with the Rickey Smiley Morning Show, Janelle went on to state that her unique style was also a means of redefining what it means to be a woman of color in the music industry. “When I got my new distribution deal, it was just important that Atlantic and everybody knew ‘Listen, I’m gonna be wearing my hair like this. I just developed this hairstyle. I’m gonna be rocking black and white. And this is what I want the music industry to see.’ I don’t want to come in and be [the] regurgitation of another female artist. I want to come in and redefine what it means to be a black female artist in the music industry,” The ArchAndroid creator revealed. 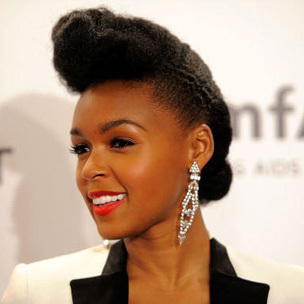 Although Janelle Monae currently serves as one of the newest faces at Cover Girl and plans on releasing her sophomore album in only a matter of days, it was just a few years ago when the singer was selling CDs out of a boarding home in Atlanta while employed at Office Depot. In regards to her upcoming album, The Electric Lady, Janelle Monae says the idea for the project’s title came as she was working on a handful of paintings. Thanks to her artwork, the idea of the electric lady came to fruition and with it thoughts of love, politics, religion, etc. as seen through the eyes of the electric lady. The Electric Lady will be released on September 10 via Bad Boy Records/Wondaland Arts Society.